Southpoint Condominium. Get-away in style. This tastefully appointed, Non-Smoking, oceanfront condominium has it all and AT ONE OF THE BEST PRICES IN THE BUILDING. This unit is beautiful. Ponce Inlet is an exclusive neighborhood just south of Daytona. The beach is pristine and traffic free making it great for kids, biking, or perhaps a romantic walk. The fifth floor gives a spectacular view of the ocean on one side and the Intercoastal Waterway on the other. You will love the peace and quiet of this area, but yet it's only a short drive to all Central Florida attractions. Visit the historic Ponce Inlet Lighthouse and Museum and enjoy some of the areas best fishing with nearby charters and party boats. Dine at many waterfront restaurants, one just a short walk down the beach. The beach is white and no drive so it is safe for you and your children and is absolutely beautiful. This condo is fully equipped with everything you need for a fun-filled vacation. We have private WI-FI in the the unit and 2 comfy recliners to watch HD TV. All you need to bring is your toothbrush. ***SPECIAL NOTE*** If you want to book a special event time or holiday, or want a check in for less than a full week or other than Saturday to Saturday, please contact me prior to making a booking request. DEPOSIT INFORMATION: A $250 deposit is needed per rental week ($500 per month) to secure your reservation. The rental fee is due 30 days prior to your arrival when you recieve the keys and directions. The deposit is fully refundable upon inspection of the units condition following your stay. CANCELLATION POLICY: If the unit can be re-rented at the same price, refunds, minus a $50 processing fee, will be given for reservations that are cancelled more than 30 days prior to check-in date. if the unit has to be re-rented for a lesser amount, refunds will be given accordingly. No refunds will be given if unit cannot be re-rented or if cancellation is received less than 30 days prior to check-in date. CHECK IN AND OUT: Check-in time is 3 P.M. (or earlier if ready) and check-out is 10 A.M.
2 HD flatscreen TV’s. One 42” living room and one 26” wall mounted bedroom. Pool is heated and has full sun all day. Very nice place and great view of ocean. The place is beautiful, exactly as shown in the pictures. The place is clean and the views are espectacular. We will definitely return soon. Thanks Jim and Nancy for allowing us to enjoy your condo. We had a wonderful time! We appreciated how well equipped the unit was, with all the basics plus more with very comfortable furnishings. 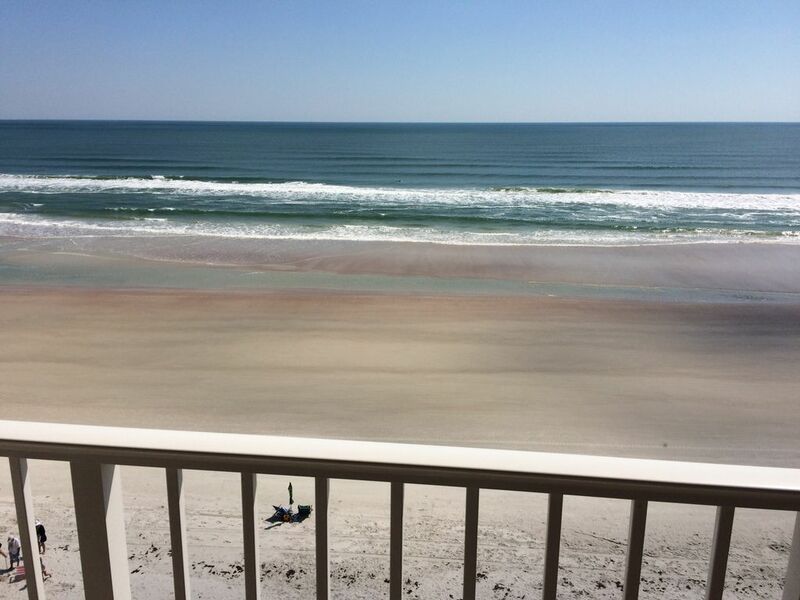 We couldn't have asked for a more perfect view of the beach. We were pleased with how sound-insulated the unit was--we couldn't hear our neighbors at all! We will definitely be back. Excellent beachfront property, this property was exactly what we needed, beautiful views, tranquility and cleanliness. Would definitely recommend to anyone looking for a home away from home! Thanks again for the use of your property. Would consider staying here again in the future. Beautiful Condo & great location! Thank you so much for letting our family stay in your beautiful condo! The pictures don't do it justice and everything was wonderful. The building is well maintained and secure and is in a great location close to all the amenities of town but far enough away to not be in a "tourist" area. Our kids loved the pool and night swimming! The location on the beach is beautiful and wasn't crowded at all! We definitely will be coming back to stay in the future. This is a very comfortable condo with a great beach front location. The fifth floor is great because you can see the Intracoastal waterway out the front and the ocean out the back. Open the balcony door or master bedroom window and you can hear the waves breaking. The condo itself is well furnished with plenty of everything you need. You don't even have to take your own towels. The building is secure with a keypad or keyed access. The pool is heated and there's an outdoor shower at the beach access. This building isn't at the public beach access and it's not surrounded by condo building after condo building so the beach doesn't get too crowded. We would gladly stay here again. Rates are subject to change until confirmation of stay. Special events such as Race Week, Bike Week, Bike October and certain holidays, may have premiums added. Weekly check in and out are Saturday only unless special arrangements are made. If you want to book a special event period or check in other than Saturday please e-mail me prior to trying to book online so special arrangements on the website can be made.